Barack Obama stated last week that, "Here in America, Islam has been woven into the fabric of our country since its founding." He is correct. Islam is deeply woven into the tapestry of America. However, he conveniently left out how it is woven into our fabric. It is the root cause of slavery in America and led to our first foreign war, prompting the creation of the Department of Navy and the Marine Corps, or corpse as Obama likes to say. 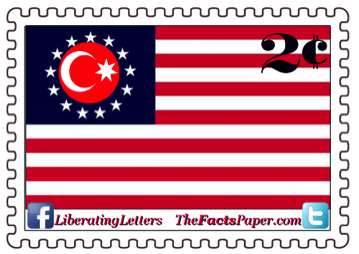 At the turn of the 19th century when Thomas Jefferson became president, Muslims were terrorizing Western countries with piracy. Muslims cited their religion as their basis to torture and enslave infidels. Anyone outside of Islam was targeted as well as Muslims who were not Muslim enough. Jefferson tried to placate the extremists by paying exorbitant extortion fees along with ransoms for captured sailors and goods as his predecessors had before him. In fact, President Washington was paying up to 16% of the Federal Budget to the Barbary States when he left office. Years before, in a letter to John Jay in 1786, Jefferson wrote about what he and John Adams learned about Islam's motivation for the unprovoked attacks from the Ambassador of Tripoli: "The Ambassador answered us that it was founded on the Laws of their Prophet, that it was written in their Koran, that all nations who should not have acknowledged their authority were sinners, that it was their right and duty to make war upon them wherever they could be found, and to make slaves of all they could take as Prisoners, and that every Musselman [Muslim] who should be slain in battle was sure to go to Paradise." George Washington’s reply to the Ambassador’s statement was, “Would to heaven we had a Navy able to reform those enemies of mankind (Muslims), or crush them into non-existence.” In 1796 Washington called for Congress to form the Navy, which was created two years later under President John Adams. After the Muslim terrorists captured, tortured and enslaved American sailors, President Jefferson decided to stop paying the Barbary States’ bribes. Tripoli then declared war on America on May 10, 1801. Jefferson finally had to fund the US Navy and the Marines after years of opposing extensive military financing. In 1805 the Marines, also known as leathernecks, led a victorious campaign to free captured sailors in the Battle of Derna on “To The Shores Of Tripoli” during the First Barbary War. Marines earned the name “Leathernecks” due to the leather collars they wore to protect their necks against Islamic cutlasses meant to behead the enemy. Some things never change. So yes, Obama was right. Islam is woven into America’s fabric from its founding. Islamists have been terrorizing and torturing Americans from our inception and we have been fighting the extremist religion since Jefferson. Last week Obama’s State Department spokesman Marie Harf informed America that we cannot defeat the terrorists by killing them. We need to address the root problem, which she claims is poverty. We need to find them jobs. When asked a day later to clarify, she proceeded to degrade anyone critical of her strategy claiming they were just not sophisticated enough to really appreciate her brilliant plan for defeating ISIS. However, her statements aren’t consistent with the facts. Osama bin Laden, the world’s most wanted terrorist, came from a very wealthy family. Many, like bin Laden, convert to Islam to fight for the caliphate because of religious reasons, not socioeconomic causes. Ms. Harf, like most progressives, believes that all the evil in the world stems from wealth disparity. It’s been said that if the only tool you have is a hammer everything looks like a nail. In a similar fashion, with a socialist worldview it’s reasonable to use poverty as the hammer and sickle as the cause of all the world’s problems. But lack of jobs isn’t the root of Islamic terrorism. The Islamic religion commands them to enslave others, kill infidels and bring about a caliphate, or one Islamic state. In the recent letter The Color-Blindness Of Slavery, I told you about the first legal slave owner, Anthony Johnson. He was originally captured in his native Angola and sold to Arab slave traders. The abductors were Muslims and were responsible for capturing Africans that eventually ended up at America's shores as slaves. Muslims were the backbone of the slave trade. Is this part of the amazing contribution that Islam made to this country that Obama so praised? If so, it would support Obama’s claim that poverty leads to terror. After all, we destroyed the Muslims’ economic foundation. We did it by eliminating slavery. We took away their jobs. Our Administration is full of Ivy League scholars who have spent years developing their Utopian strategies for the world. All that has to happen is to level the playing field for everyone and everyone will be happy, or at least equally miserable. Social elitists are so wrapped up in their own brilliance and enlightenment that they are blinded to the reality of radical Islam, because it’s outside their worldview. Secretary of State John Kerry lectured ISIS saying, “This is the 21st century and we should not see nations step backwards to behave in 19th and 20th century fashion.” That is great if we have risen above such barbaric means of warfare, but Kerry doesn't have the willingness to accept that these radical Muslims haven't. Radical Islamists prove it daily as they burn, behead, and crucify those that deny Allah in a manner reminiscent of Genghis Kahn. If the leaders of our country don't wake up, we will actually fall because of our own arrogance. A few days before Harf’s comments, some "rogue, isolated" ISIS members beheaded 21 Coptic Christians from Egypt on the shores of Tripoli. (see To The Shores Of Tripoli) Liberal elitists have been preaching to the unwashed masses that we should not fight the terrorists that hate us. We need to befriend them and understand them. (see D-Day vs. Today: How Far We've Come) Perhaps we should send in a wave of Peace Corps volunteers rather than Thomas Jefferson's barbaric response to terrorists two centuries ago of using Marines. The simple fact is, only our response has changed, not their tactics. Radical Islamists want to kill us because their leader, the prophet Mohammad, demands that infidels be slaughtered. These beheadings are not isolated incidences for ISIS, they are the norm for Islamists throughout history. By conducting the beheadings on the Tripoli shores, ISIS is telling the world they want a Third Barbary War. They laid down the gauntlet to America telling the Marines “Come and get us.” In response, Obama went golfing. This administration refuses to look this evil in the face. Instead it fights nonsense battles against global warming, even as the country suffers under record breaking cold and snow. By not acknowledging evil and truly opposing ISIS, this administration, along with other European countries, is permitting ISIS to continue its killing spree. Unless we wake up and turn back to God, we are allowing ISIS to get stronger and more powerful to the world’s detriment.